On Saturday and Sunday, September 29 and 30, battle returns to Claregalway Castle as members of the Irish Full Contact Medieval Combat Team prepare to face opposition from some of the world’s top fighters. 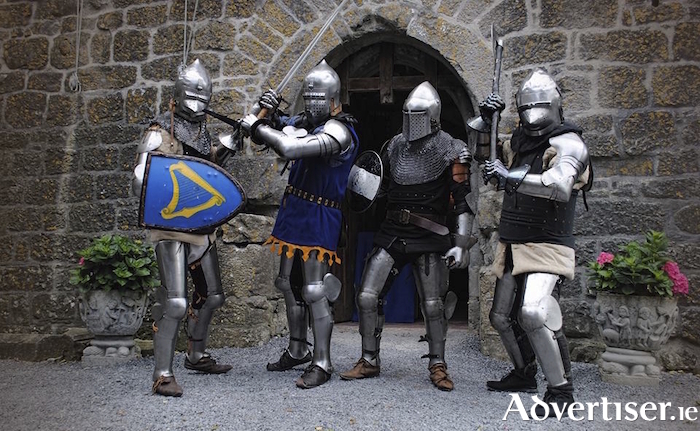 For the fourth year the beautifully restored castle, built by the De Burgos in the early 1400s, will host the Claregalway Castle Shield, a revival of the medieval foot-combat tournament. Fighters from England, Scotland, the USA and elsewhere, clad from head to toe in steel medieval armour, will be competing in both one-on-one categories and five-on-five team fights. The combat is full-force and not staged or choreographed in any way, and requires an extremely high level of fitness and stamina. Be amazed by a display of mounted archery and combat by Andrew Ó Donnghaile and other world class horseman. Among the competitors will be top Irish fighter Lara Servoille, fresh from winning her second gold medal in the Longsword contest at the World Championships in Scotland in May 2018, and ready to take on all comers to defend her reputation as the “medieval Katie Taylor”. For a full two days, in addition to exciting combat, there will be music, magicians, puppets, archery and much more at this family-friendly festival. Meet Nemo the Magician and Marco the Alchemist. Talk to Blacksmith and Sword merchant, Wool Dyer and Carder, Baker and exotic spice merchant. Listen to stories from the Alewife and others. Come to the Castle for a unique event that combines fun and high educational value. Better still, come in period costume and compete for valuable prize. Admission: Adults €10, Children €5 Open 11.00am to 6.00pm daily and there will be limited on-site parking.